Our 7 day weather forecast for Marlborough updated throughout the day, making it ideal for planning leisure activities, travel and events. Read more about our weather forecasts. On Monday 22nd April 2019 the sun will rise at 05:57 and will set at 20:15. It will be a mild day, with temperatures reaching around 19.9°C. Today is expected to be a dry day, with a very low chance of rain. It will be quite a breezy day, with a maximum expected wind speed of 16mph. On Tuesday 23rd April 2019 the sun will rise at 05:55 and will set at 20:17. It will be a mild day, with temperatures reaching around 20.2°C. Today is expected to be a dry day, with a very low chance of rain. It will be quite a breezy day, with a maximum expected wind speed of 17mph. On Wednesday 24th April 2019 the sun will rise at 05:53 and will set at 20:18. It will be a mild day, with temperatures reaching around 13°C. Some moderate to heavy rain is expected, 5mm of rainfall is possible today. It will be quite a breezy day, with a maximum expected wind speed of 22mph. On Thursday 25th April 2019 the sun will rise at 05:51 and will set at 20:20. It will be a mild day, with temperatures reaching around 12.4°C. A light shower is possible, 2mm of rainfall is possible today. It could be quite a gusty day today, with a maximum expected wind speed of 28mph. On Friday 26th April 2019 the sun will rise at 05:49 and will set at 20:22. It will be a mild day, with temperatures reaching around 13.5°C. Today is expected to be a dry day, with a very low chance of rain. It will be quite a breezy day, with a maximum expected wind speed of 25mph. On Saturday 27th April 2019 the sun will rise at 05:47 and will set at 20:23. It will be a mild day, with temperatures reaching around 12.2°C. A light shower is possible, 2mm of rainfall is possible today. It could be quite a gusty day today, with a maximum expected wind speed of 32mph. On Sunday 28th April 2019 the sun will rise at 05:45 and will set at 20:25. It will be a mild day, with temperatures reaching around 5.8°C. Today is expected to be a dry day, with a very low chance of rain. It will be quite a breezy day, with a maximum expected wind speed of 19mph. Our weather forecast for Marlborough is updated throughout the day and has been found to be very reliable for planning activities such as days out, leisure, travel, events, fishing, golf and gardening. Inn with 6 rooms, bar and restaurant. Megan and Mike Shaw have been at The Inn with the Well (formerly The Old Crown) since 1991 and warmly welcome you to their tranquil retreat (no Pool tables or Jukeboxes or Gaming machines) in the heart of the rolling Marlborough Downs, close to Avebury, Stonehenge and Bath. The Inn with the Well gets its name from the original well set in the restaurant floor. Bullet proof glass has been used to provide a safe cover for the well, allowing you to stand on top and look down inside this original feature. 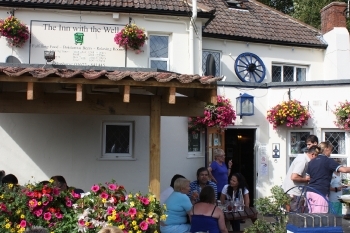 The Inn with the Well is a traditional coaching Inn (established in 1647) and is set in the midst of the rolling Marlborough Downs on the Ridgeway path – Europe’s oldest highway. The Inn is just 5 minutes from Junction 15 of the M4 Motorway and 2 golf courses are within a 5 minute drive. As a traditional Inn, Beer or Real Ale is a focal point for many visitors. 6X (made in nearby Devizes) and guest beers are always poured straight from the barrel in the cooled cellar. Guest beers are sourced from local Micro or Regional brewers. We welcome well behaved supervised adults with children and Dogs on leads.